We are so excited Freyja Sewell will be joining the Midcentury Modern fold this September at our pop up of 18 dealers and designers on the ground floor of the Old Sorting Office, New Oxford St at the biggest show of The London Design Festival, Design Junction. Ever since we climbed into her womb of a pod HUSH at Clerkenwell Design Week we have yearned to repeat the luxurious escape from the design show jungle. 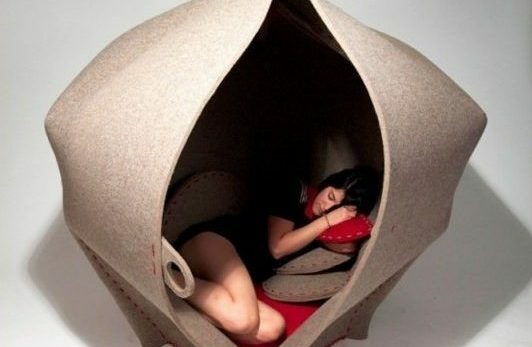 HUSH is a private space within a public world. Constructed from natural, bio- degradable materials, it took three years to make. Just imagine the difference it could make to the user in the middle of a busy hotel, airport, office or library? 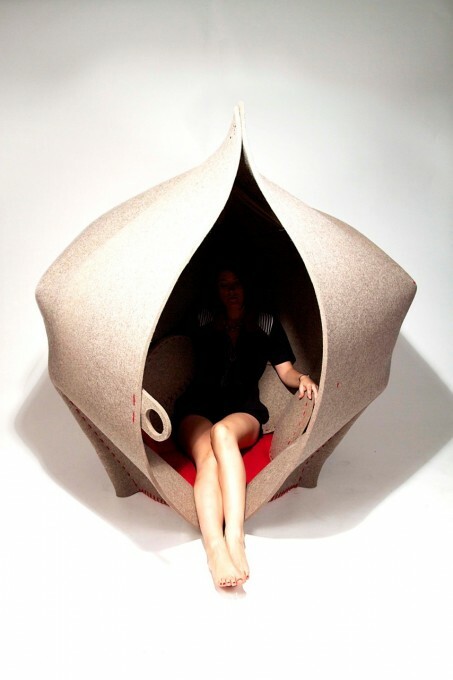 The main body of HUSH is cut from a single piece of 10mm industrial wool felt. The internal padding of HUSH is made from recycled wool fibre, produced as a by-product of the British carpet industry. HUSH is manufactured by Ness Furniture in Durham by skilled furniture craftsmen and women and aims to help support and revitalise Britains ancient heritage of makers. Also on display in the Midcentury Modern Pop Up will be several other of Freyja’s designs including HUSH shades, made from the waste felt from the HUSH chair production and HUSH’s sister product, the SMUSH chair, will be available to try. Freyja will also be presenting entirely new work, the HUSH Hood; a small pop-up privacy device and HUSH cave, a dramatic sound absorbing light feature. Read more about other designer launches and happenings on our partner page at www.londondesignfestival.com after you enjoy this beautiful, sensitive video about the making of her signature piece, Hush. Kelly Lock liked this on Facebook. Ruth Tatham liked this on Facebook. David Ryder Richardson liked this on Facebook.